Last post it was the evolution of my Mama summers. Now, it’s M’s soccer. As I’ve written before, I actually recorded M’s first kick of a soccer ball for the historic record (such a first-time parent thing to do, right? Zero record of J’s first athletic endeavors. Lucky there were no subsequent children, or I may never have fed or dressed them). 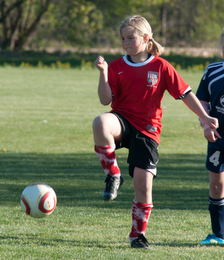 We were super-excited to get her registered with town’s soccer program when she was in kindergarten, but then. . . she wasn’t into it. She went, but she wasn’t thrilled. She moved on to other things for years, so that when she was in second grade, I said right here, definitively, that the girls were all about dance, not soccer. The next fall, when J was starting kindergarten and M was starting third grade, both girls agreed to do the soccer recreation league. This time, Cute W left nothing to chance. He signed up to coach both teams and set about making sure that soccer was super-fun. J wasn’t into it, but M got hooked. Actually, it was pretty funny, because J was a stand-out on her team largely because she had the maturity to follow the rules, like stopping at the line instead of continuing past the end of the field and running toward the playground, mid-game. But pretty soon, J had cast soccer aside for gymnastics. M, meanwhile, fell for soccer, complete with growling on the field, just like Coach Cute W had taught her. Then she started doing “travel,” which basically just means that she had joined the town soccer club to do soccer beyond the rec soccer season. So way back when, when M got a bit more serious and the local club wasn’t cutting it anymore, Cute W and M diligently visited a bunch of clubs and ended up going with Black Watch Premier. We had several lovely years with Black Watch. Over the years we’ve talked to a ton of people who’ve played for a variety of different clubs. Basically, none of them are perfect. There are so many factors to consider, like the overall club culture and communication and coaching style, but also there’s the individual coach or coaches assigned to your kid’s team, the other players on the team, the other parents on the team, how often and where you practice, how much it all costs, and how far and frequently you travel. Every year there’s this opportunity to switch around, and for years and years, we stayed. We generally had really great coaching, M loved many of the girls, and we liked the parents. It was a little family, and look how fierce she got! (Yes the baldiness helps with the fierce look, for sure). This year we gradually realized that it was time for a change. Mainly this was Cute W and M realizing it, and me reluctantly following along, wistfully looking back at the very short commute times to practice, the people we know and like, and the accumulation of so much Black Watch gear in our house. At the end of the school year, Cute W and M visited the try-outs for Black Watch, Alleycats, Nirvana, and Global Premier Soccer. She was basically doing soccer at a different place every night for two weeks. This was a period of high drama, because you never knew who would show up and who would be switching clubs. Some kids were trying to be very inconspicuous because they still had tournaments to play with their current club, and they were afraid they’d be penalized by a coach for looking around. You’d run into parents for another club and they’d try to recruit you or warn you away from one club or another. A coach would tell a parent that their child would be in the Super Awesome level, and then they’d be chatting with another parent and had no idea if they’d said the same thing to the other parent’s child. You’d go to a try-out all alone and run into several friends, and they’d report how some other try-out had gone, or they’d lament that their kid wouldn’t even consider a particular club (which was true of M, who wasn’t interested in one club based on how the girls behave when she plays against them). It was all pretty awkward. So it was a relief when the decision was made, and both Cute W and M agreed that we should switch to Global Premier Soccer. Mostly this was based on the professionalism of the coaching, the seriousness of the girls, and extra practice time. GPS means longer rides to practice (I’m really hoping for a good carpool), a little bit cheaper fees and hopefully a bit less travel, and a whole new group of girls and parents. We thought that this would be really tough for M, and we worried that players or coaches would try to convince her to stay. But once the decision was made, she felt good about it, and her friends were all supportive. Now that the decision’s made, we’re all excited for something new. But first there’s school soccer. School soccer’s been an up-and-down journey, too. In middle school, M loved her 7th grade soccer season like crazy. The girls bonded so much that they were a sobbing mess when the season was over. Her 8th grade year was fun but didn’t quite measure up. In 9th grade, the season began with their own set of dramatic try-outs: most kids (including M) landed on JV, but it was possible to be placed on the “Mod 9” team, the JV team, or the Varsity team, and the exact placement didn’t always make sense. Then, once school started, soccer was fun, but the accompanying pasta dinners, dress-up, and other “spirit” activities made the schedule feel pretty overwhelming. Still, it was a good season. 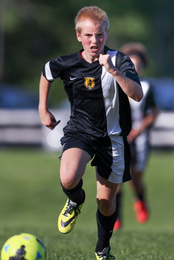 The girls soccer culture is strong at our school, and after an only so-so soccer season with Black Watch, M’s super-excited for school ball to start, especially now that she’s moving up in the world, a sophomore. M’s been going to the school’s weight training sessions, and she and Cute W have been brushing up on footskills in their free time. Pre-season starts in earnest in three and a half weeks, and then means that in a little over a month they’ll be more drama as the girls find out who’s playing on which team. Stay tuned.